So, if you didn't have anything better to do, you might consider crossing a city one day...well maybe an entire state...but how about an entire country? Well, that's exactly what Achim Heukemes did in 2005, when he crossed Australia, from Perth to Australia. Traveling eastward across the entire country, he covered some 4600 kilometers in 43 days. 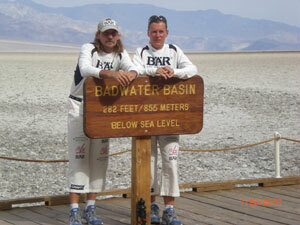 Now, back for his second time at Badwater, Achim and his mate Dagmar Grossheim are both hoping to earn the coveted Badwater belt buckle. At the start, Achim commented on the "unusual weather" and was hoping for a good finish to the race. Clouds covered the race for most of the first day, with temperatures at an unusual low through Furnace Creek...at 11:00am, temperatures at the check-in station were only 106 degrees, positively balmy for July in Death Valley. Later, at Furnace Creek, I ran into Mueller Juergen, who is filming for Achim's crew, and he filled me in on some of his friend's impressive past exploits. Last year he took part in the Decathlon Ironman World Championships in France, where every event is 10 times its normal length. That meant a 38 kilometer for, 1800km biike, and 422km run. Oh yes, and if that wasn't enough, he needed to learn how to swim in order to compete, and still managed to finish 5th overall. In 2009, Achim will be doing the TransEuropaLauf, from Scandinavia to south of Italy (about 4500 km). The winner of the original version of that race, which went from Lisbon to Moscow, was Robert Wimmer, who had run Badwater in 2004, but ended up finishing in ninth place due to some knee problems. Sponsored in part by BAR athletic gear, Achim is also running for a charity that fights a particular form of children's bone cancer (for more info on his charity, visit http://www.runforlife05.com).